I thought I’d make today Day #2 (of 2) of my spraypainting kick. I love me a good wine. That’s why when we headed to San Francisco for our anniversary, Dan suggested we make the short trip to Napa. No arguments here. I couldn’t wait to go. We were only there for a one day tour of four wineries, but I wish we had stayed another day. So many wineries, so little time. That day, in total, we probably tried around eighteen different wines. My favorite of the day was the White Riesling from V. Sattui. Dan’s favorite was the Pinot Noir from Whitehall. A close runner up for me was the Gamay Rouge, also from V. Sattui. We tried so many wines that day, that I had to write down the names of my top choices so I could go back and later decide which to buy. The only reason I remember the three types of wine I just listed is because we bought a bottle each of the White Riesling and the Pinot Noir, and the Gamay Rouge was a favorite of my in-laws, so that name stuck out in my head. The fact is, I just don’t remember which wines I like. I shop for wine perhaps the worst way you can – by name. Lucky Duck? That sounds good, so I throw it into the cart. Same thing with Mad Housewife, True Love, Honeymoon, and Red Truck. I remember the names, but don’t remember if they were good. 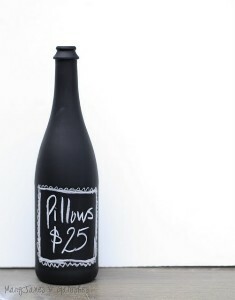 Enter the chalkboard wine bottle. Plus, I thought it would make an adorable decor addition to the kitchen, where we already have a chalkboard theme going with the main chalkboard on the wall and these fun chalkboard glass jars we use for cookies and Phoebe’s treats. This was super easy project to make. 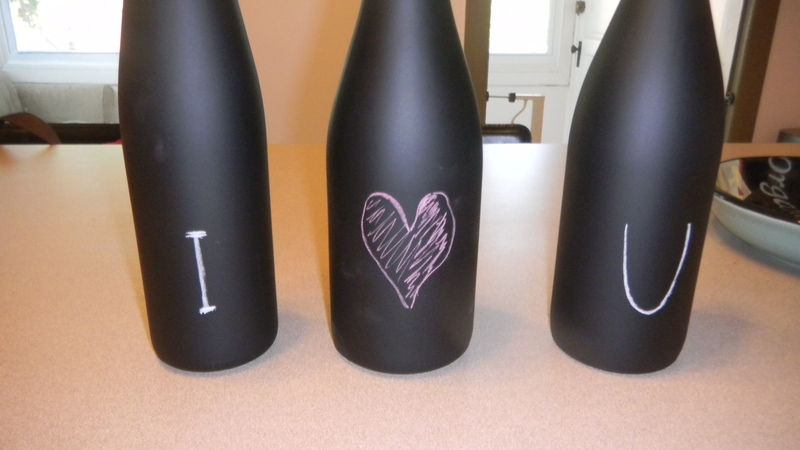 I found some chalkboard spray paint at Home Depot for under $5. I had been keeping empty bottles of wine around, since I knew this project was coming. I washed out the bottles and took the labels off. Next, I put some newspaper in the top of the bottles, to keep paint from spraying inside. Then I sprayed. Only took a couple coats. Once the bottles were dry, but before I did anything to them, I walked in to the kitchen and saw this message waiting for me. Awww. I heart you too, Dan. I sat with Dan and thought of the wines we liked that we could remember, and got a list going. We’ll be sure to add on as we find our favorite wines. 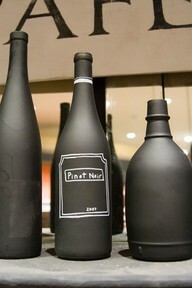 Do you have any recommendations of great wines to try? Hi Sarah,Thanks for the recommendation. I’ll be sure to try it out and report back,. I’m actually partial to the whites (Dan prefers reds), so I’ll have to try one of each. You know, just to be fair.It has been a long time! I hope things are well with you and your sister too!